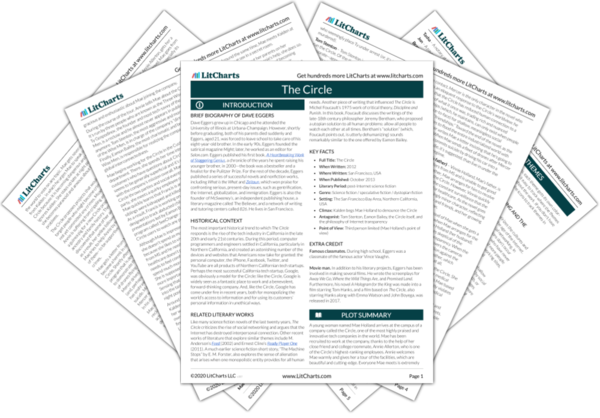 Instant downloads of all 946 LitChart PDFs (including The Circle). Welcome to the LitCharts study guide on Dave Eggers's The Circle. Created by the original team behind SparkNotes, LitCharts are the world's best literature guides. A concise biography of Dave Eggers plus historical and literary context for The Circle. A quick-reference summary: The Circle on a single page. In-depth summary and analysis of every Book of The Circle. Visual theme-tracking, too. Explanations, analysis, and visualizations of The Circle's themes. The Circle's important quotes, sortable by theme, character, or Book. Description, analysis, and timelines for The Circle's characters. Explanations of The Circle's symbols, and tracking of where they appear. An interactive data visualization of The Circle's plot and themes. Dave Eggers grew up in Chicago and he attended the University of Illinois at Urbana-Champaign. However, shortly before graduating, both of his parents died suddenly and Eggers, aged 21, was forced to leave school to take care of his eight-year-old brother. In the early 90s, Eggers founded the satirical magazine Might; later, he worked as an editor for Salon.com. Eggers published his first book, A Heartbreaking Work of Staggering Genius, a chronicle of the years he spent raising his younger brother, in 2000—the book was a bestseller and a finalist for the Pulitzer Prize. For the rest of the decade, Eggers published a series of successful novels and nonfiction works, including What is the What and Zeitoun, which won praise for confronting serious, present-day issues, such as gentrification, the Internet, globalization, and immigration. Eggers is also the founder of McSweeney’s, an independent publishing house, a literary magazine called The Believer, and a network of writing and tutoring centers called 826. He lives in San Francisco. 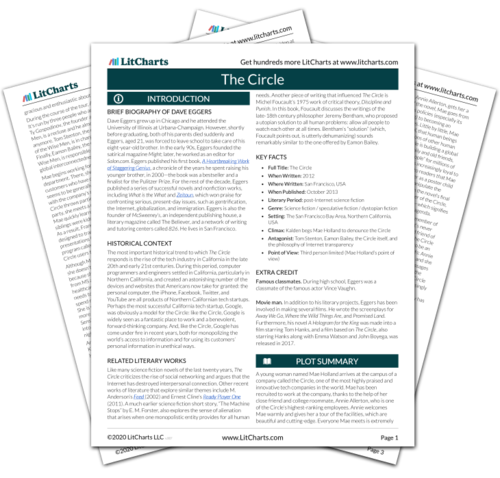 Get the entire The Circle LitChart as a printable PDF. The most important historical trend to which The Circle responds is the rise of the tech industry in California in the late 20th and early 21st centuries. During this period, computer programmers and engineers settled in California, particularly in Northern California, and created an astonishing number of the devices and websites that Americans now take for granted: the personal computer, the iPhone, Facebook, Twitter, and YouTube are all products of Northern Californian tech startups. Perhaps the most successful California tech startup, Google, was obviously a model for the Circle: like the Circle, Google is widely seen as a fantastic place to work and a benevolent, forward-thinking company. And, like the Circle, Google has come under fire in recent years, both for monopolizing the world’s access to information and for using its customers’ personal information in unethical ways. Like many science fiction novels of the last twenty years, The Circle criticizes the rise of social networking and argues that the Internet has destroyed interpersonal connection. Other recent works of literature that explore similar themes include M. Anderson’s Feed (2002) and Ernest Cline’s Ready Player One (2011). A much earlier science fiction short story, “The Machine Stops” by E. M. Forster, also explores the sense of alienation that arises when one monopolistic entity provides for all human needs. Another piece of writing that influenced The Circle is Michel Foucault’s 1975 work of critical theory, Discipline and Punish. In this book, Foucault discusses the writings of the late-18th century philosopher Jeremy Bentham, who proposed a utopian solution to all human problems: allow all people to watch each other at all times. Bentham’s “solution” (which, Foucault points out, is utterly dehumanizing) sounds remarkably similar to the one offered by Eamon Bailey. Famous classmates. During high school, Eggers was a classmate of the famous actor Vince Vaughn. Movie man. In addition to his literary projects, Eggers has been involved in making several films. He wrote the screenplays for Away We Go, Where the Wild Things Are, and Promised Land. Furthermore, his novel A Hologram for the King was made into a film starring Tom Hanks, and a film based on The Circle, also starring Hanks along with Emma Watson and John Boyega, was released in 2017. Arn, Jackson. "The Circle." LitCharts. LitCharts LLC, 14 Mar 2017. Web. 24 Apr 2019. Arn, Jackson. "The Circle." LitCharts LLC, March 14, 2017. Retrieved April 24, 2019. https://www.litcharts.com/lit/the-circle.